Granite is an excellent choice for kitchen countertops, floors, and other heavily used surfaces. Granite has a rich beauty that few other countertop materials can match. It is a natural product with timeless aura and appeal, and can easily become the centerpiece to your room. With the very many colors and styles, you can find one that complements your kitchen perfectly. Granite is a very hard substance that is not easily susceptible to scratches. While it is not ideal to cut directly on your granite surface (because it will dull your knife! ), it will take daily wear and tear very well. Granite resists heat, too, so use in the kitchen is ideal. Marble is a natural product, so no matter what the application, it will change, age, and wear over time. On a countertop or vanity you’ll want to address any concerns you have about etching and staining. When sealed properly, staining can be avoided on a marble countertop application, but etching is unavoidable. Acid from substances such as red wine, sauce, or lemon juice can react with the calcium in your marble, and cause an etch mark when left on the surface for an extended period of time. Many homeowners choose to hone the surface of their marble countertops to help disguise the imperfections that appear over time. To see a real application of marble, visit our showroom where we have a Calacatta Marble island with 15+ years of wear & tear. One of our knowledgeable stone consultants will be happy to help you figure out if marble is right for you! Many marbles are mislabeled as quartzites. The most commonly mislabeled material we hear of is Super White, often called Super White Quartzite. Super White is actually a dolomitic marble - AKA a very hard marble. Therefore, many people who install materials like this in their kitchen are expecting it to react like a quartzite. Within weeks, the true nature of the material shows itself by revealing an etch mark or stain. If you are not expecting this to happen, it can be quite frustrating. EleMar tests all their quartzites with acid, ensuring that they are true quartzites. We are happy to help you identify questionable materials you may find! Known for its sparkly nature, Calcites are typically white and translucent and can have soft veins of light blue, gray, green and other light colors. 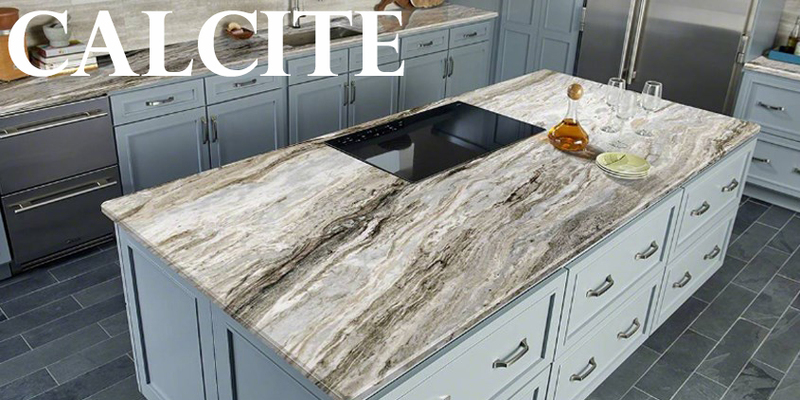 Because of their grain structure and appearance, they can sometimes be mistaken as quartzite. Although they look like quartzite, they are very different in terms of durability. Calcite is closest in durability to marble, it can scratch, etch, and stain - however is slightly more forgiving than traditional marble. Common substances used in the kitchen, like tomato sauce, lemon juice, and wine, are acidic and can etch your countertop if they are not wiped up. Staining can be avoided by sealing your stone (but the sealer will not prevent etching). Make sure you fully understand the pros and cons of calcite before selecting one. Like with marble, a honed or leather finish is often used to help disguise any imperfections that are caused over time. Fantasy Brown is one example of a calcite that is often mislabeled as a quartzite or granite. Fantasy Brown can etch and have the same durability as other harder marbles. We would be happy to go over the expectations when installing this in your kitchen or bath. Quartz, not to be confused with natural quartzite, is a man made material consisting of natural quartz and polymer resins. EleMar carries the Caesarstone line, and there are dozens of color options to choose from. Caesarstone quartz can mimic the appearance of marble, without the maintenance that comes with natural marble. It also has a variety of other looks, such as limestone, concrete and granite appearances. Quartz has been becoming very popular in the industry, due to its consistency and durability. It is important to understand the care attributes of quartz in order to keep it looking beautiful. Caesarstone quartz does not require sealing, which is appealing to homeowners. A polished quartz will have little to no maintenance, although you will want to be careful with heat. While quartz is heat resistant, it can still scorch under high temperatures. Never put a hot item directly on a quartz surface! Additional care and maintenance will be required when considering other finishes besides polished. If you are considering a honed, concrete, or rough finish for your Caesarstone quartz, visit Caesarstone’s Care & Maintenance page for care instructions and what to expect. Or, contact EleMar for details!